While there are numerous opportunities through networking, education, and advocacy, some associations can be very high school with cliques, politics and egos run amok. Even more common is a situation with regional associations where one or a few agencies control the board, educational content and events simply to shill their services. The marketplace is challenging enough without having to deal with a loaded deck. 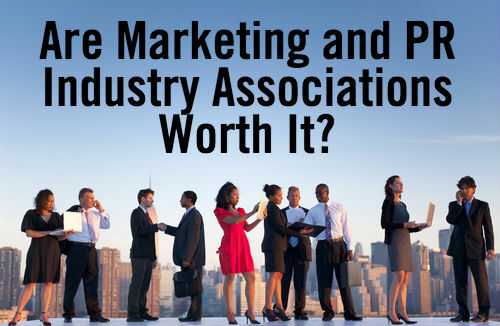 Is spending your time with an industry association worth it? 1. What do you hope to achieve personally? For your company? 2. What value does the association currently create for members? What could be improved? 3. What opportunities are there to contribute and be involved? 4. Are you already connected to members or leadership? 5. How is the association structured and who are the real players? For many marketing and PR professionals, membership in an association provides access to learning opportunities and networking events and that’s enough. For others, associations can provide an opportunity to develop and flex your leadership skills amongst peers that can both help the association reach industry objectives and expose your talents to future employers, partners and employees. As long as you’ve defined goals for yourself and you make an effort to network and contribute, you can get value from any industry association, whether they’re slow moving and cliquish or something more progressive. I’ve been involved the longest with the PRSA (2006) and MIMA (2001). We’ve also been a sponsor in one way or another of SMBMSP for several years. I recently become a member of MN Search and BMA (National and Minnesota), and am looking forward to seeing how we can mutually benefit. Move on to another association. Get disruptive and lead the organization to change. Like anything, you’ll often get out of it, what you put in to it. What marketing or PR industry associations do you belong to? What do you like best about them? What would you like to see improved? Great Advice. I belong to the AMA and having done what you recommended, have gained a lot from my membership.